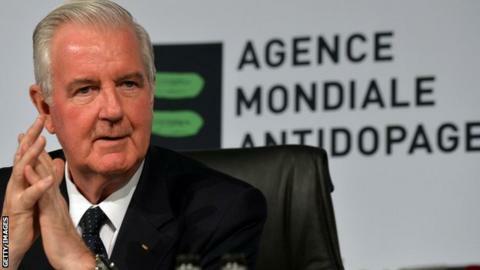 Banning nations for persistent doping would damage athletics and is not an option, says World Anti-Doping Agency (Wada) president Sir Craig Reedie. There have been calls for the worst-offending countries to be expelled from competition if they cannot control doping among their athletes. It follows recent allegations of widespread cheating in the sport. But Reedie said such bans would be "blunt-edged" and "damage the innocent as well as the assumed-to-be guilty". He told BBC World Service: "We're not entitled to do it, we don't have these powers." "I would hope increased efforts, whether it's research or education, in testing athletes at the right time will help us catch cheats, and that people will begin to realise that cheating in sport doesn't make any sense." Wada will begin an independent investigation after the Sunday Times published data from 12,000 blood tests involving 5,000 athletes, which it says reveals an "extraordinary extent of cheating". The International Association of Athletics Federations (IAAF) responded by describing claims of widespread doping in athletics as "sensationalist and confusing". Meanwhile, the IAAF confirmed on Tuesday that 28 athletes who competed at the 2005 and 2007 World Championships had been provisionally suspended after returning "adverse findings" from retested samples. Reedie, a former president of the British Olympic Association, said the re-testing was "very significant" and would allow samples to be re-examined "in the light of better testing techniques". "If they are able to detect somebody who cheated all those years ago, the IAAF says it will reallocate medals," he added. "That's good news for clean athletes and we are in the business of protecting clean athletes." However, one of the blood scientists who analysed the leaked test data for the Sunday Times investigation has questioned whether the IAAF has done all it can to catch drug cheats in recent years. In an open letter to IAAF presidential candidate Lord Coe - who said the story was a "declaration of war" on his sport - Michael Ashenden also defended his role in the revelations. "Had I walked away from an opportunity to agitate for change then I would have betrayed every voiceless athlete who has been cheated out of podium glory," he wrote. "I would not have been doing my utmost to prevent doping in sport."